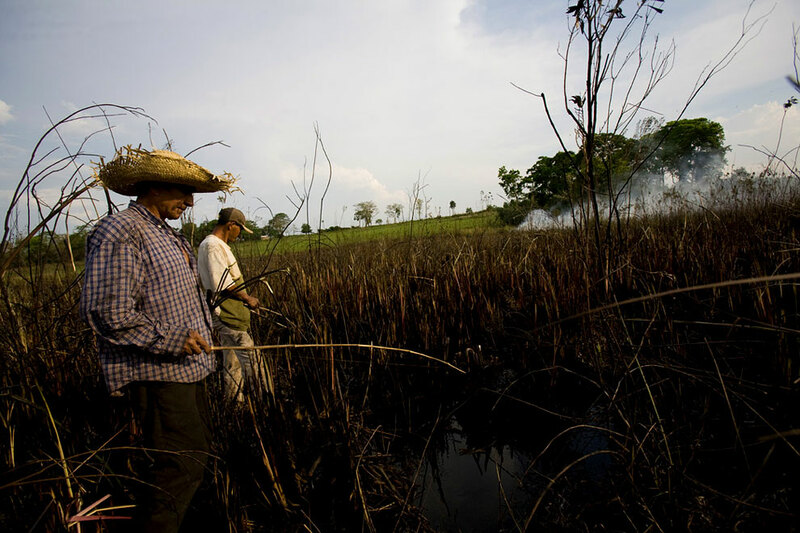 Carumbey I, Lima district, San Pedro--October 26, 2008--Farmers from Carumbey I fish in communal land belonging to their village as the smoke and floating ash of deforestation from a neighboring transgenic soybean plantation pollutes the air and paints the water black. Although the land that is being clearcut and set ablaze is beyond the boundaries of the Brazilian soybean producer's fence, and thus belongs to the community, the farmers say that there is little they can do to stop it. Like most district attorneys in Paraguay, the one who handles land disputes in Carumbey I is a sympathizer of the economic growth brought about by the new frontier of agro-industry in the San Pedro department. For the most part, the demands of local communities who exist on subsistence farming go unnoticed.